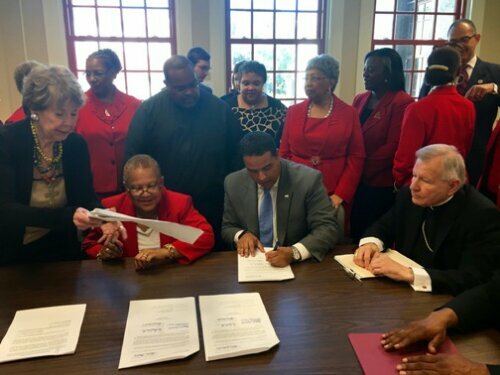 An act of sale of Epiphany Church was signed between the Archdiocese of New Orleans, Corpus Christi-Epiphany Church and the Delta Sigma Theta Sorority Foundation. The Delta Sigma Theta Sorority Foundation purchased the church buildings, located at 1949 Duels Street, to renovate into a community resource center serving the Seventh Ward area of District “D”. Attending the September 29th signing was Demetric Mercadel, Delta Sigma Theta Sorority member Sheila Danzey, Epiphany Church’s Father Roderick J.D. Coates and Archbishop Gregory M. Aymond.